Watches are extraordinary things. Feats of engineering you can strap to your wrist. Whether you choose mechanical or quartz, traditional or smart, your watch has an important role: It lets people know who you are. Even if that’s just a guy who wants to know the time without reaching into his pocket. On the corner of a nondescript block in Lancaster County, Pennsylvania, is a bank, or what used to be a bank. Now it is the home of Roland G. Murphy Watch Company, the country’s only true independent elite watchmaker. Inside, Murphy’s son-in-law, Adam Robertson, is bent over an old watchmaker’s drill press that looks like it was made during the Korean War. 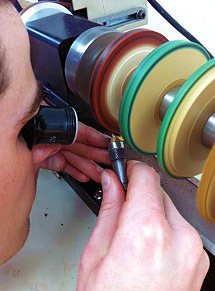 He uses an abrasive bit to create burnished, circular perlage on the underside of the main plate of the watch movement. He is focused and unmoving, his attention riveted to the plate, whose decoration no one will ever see. Later he’ll hand-polish the bevels of the screw holes on the tiny bridge that holds the wheel-train gears in place. High-end watchmaking has not, for the most part, always been something you find in Amish country. Or, for that matter, in the United States. Typically, if you go looking for horological greatness, the kind of virtuosic craftsmanship associated with the greatest watchmakers, you go to Switzerland. If you are looking for scrapple, you go to Pennsylvania. But Murphy, the 53-year old owner and sole proprietor of the watchmaking company that bears his name, is the exception. Like some of the small European companies directed by a single watchmaker, RGM makes fewer than 300 watches a year. In contrast, the brands worshipped by most enthusiasts – Patek Philippe or Vacheron Constantin – produce tens of thousands a year. Rolex produces 2,000 a Of course, Rolex doesn’t operate in a space that looks more like an Elks Lodge than a watch manufacturer, with a collection of vintage cameras filling shelf after shelf, along with various other mementos. But then Murphy himself doesn’t fit the bill of a classic watchmaker. Burly, and with a thick head of salt-and-pepper hair and a bushy moustache to match, he looks more like a Pop Warner football coach. Like most watchmakers, he started out doing repairs, and found himself drawn to the silent, obsessive work of creating tiny universes of absolute order. After a few years of working on clocks, he found his way to Switzerland, where he made the horological equivalent of the big leagues: training at the Watchmakers of Switzerland Training and Education Program, the Swiss watch industry’s official certification program in Neuchâtel. Not long afterward Murphy landed at Hamilton Watch Company, where he eventually rose to an executive development position. Hamilton, it ought to be noted, is a famous American watch brand. But the dirty secret of nearly all American watch brands, Murphy’s excepted, is that they are either owned by the Swatch Group outright or utilize movements built and exported by one of its subsidiaries. Most of the American watch companies you’ve heard about are using Swiss movements and Chinese casings. And none even tries to produce the kind of arcane complications – a whirling tourbillon that compensates for gravity, say, or a precision moon-phase subdial – associated with the Patek Philippes and Jaeger-LeCoultres of the world. RGM makes what are by far the most intricate and ambitious timepieces produced in the United States. But they aren’t just clones of Swiss watches either. They’re inspired by the tough, durable railroad watches of industrial America. The paradox, of course, is that this rugged practicality is actually pure poetry. A $40 Casio G-Shock keeps more accurate time than a Breguet; a hot-pink Swatch a fourth-grader wears in the pool is more reliable than a watch that costs more than her home. When you think about it, there’s no reason for anyone to create in-house movements for an American watch. Murphy’s quixotic commitment to craftsmanship has no value to anyone but an equally idealistic buyer. Nowhere is this clearer than in Murphy’s masterpiece, the Pennsylvania Tourbillon. A mechanical watch, no matter how perfectly made, is affected slightly by gravity. The rhythm of its escapement, the part of the movement that regulates timekeeping, varies slightly based on how the watch is positioned. Not that anybody other than watchmakers would care or even notice. But the gravity problem stymied them, and so in 1801, Abraham-Louis Breguet patented a rotating cage to suspend the escapement, freeing it from the effects of gravity. Manufacturing a tourbillon is incredibly hard, which is why almost nobody does it. It’s also why two or three guys doing it in a Pennsylvania bank building borders on the fantastic. Two bridges hold the tourbillon cage in place. Murphy and his master watchmaker, Benoît Barbé, bore tiny holes in the bridges to mount the escape wheel, pallet, and balance. They friction-fit a gold ring inside each hole and a jewel inside each ring. The 90-degree angle of the drilling, the depth of the holes, and the ring-and-jewel fittings must be precise to ensure the perfect relative positioning of the parts. The slightest variation would ruin the mechanism.The completed tourbillon turns 360 degrees once per minute, driven by a tiny spring coiled around the central axis. All of this work, by the way, can only be done by hand. A few of the parts can be machined, but even those parts are usually made by equipment the two men created themselves. Murphy doesn’t build watches for himself or his buyer. He builds for an ideal: that things should always be better than what’s necessary. “We don’t design on the limit,” Murphy says. “Think about the Brooklyn Bridge. How much weight do you think it had to bear when they built it? Some horse carriages? Some pedestrians? Today there are giant semi trucks going over it all day, and it supports that weight because it wasn’t designed to the limit. That’s something we take pride in.” And it’s something you won’t find anywhere else in America. I had the great privilege of being invited to tour the factory of one of the last true watchmakers who designs and manufactures wristwatches in the United States—RGM Watch Co. The day culminated with the unveiling of his latest wristwatch—Baseball in Enamel—at the NAWCC headquarters. Founder Roland G. Murphy met us outside RGM’s design and manufacturing workshop at 801 West Main Street, Mount Joy, PA, not far from the NAWCC headquarters in Columbia. RGM employs only 12 staff; of course, most of them are watchmakers, who were on hand to demonstrate the stages of making a wristwatch. Because of size constraints, RGM had to limit its second open house on the premises to about 60 people. We were split into groups of about 10 each for the tour. The ground ﬂoor is spacious and bright—a large room with high ceilings and excellent light—carefully laid out with benches, test equipment, and Roland’s famous Rose Engine machines, used for ﬁne movement and dial guilloché. Our ﬁrst stop was the timing machines and optical comparator. To most watch enthusiasts the accuracy of a watch is as important as its aesthetics—maybe even more so. Beauty is in the eye of the beholder, but the accuracy of the timepiece is understood by all. Watch enthusiasts look for accuracy of plus or minus two to three seconds a day, even with a mechanical piece—not an easy task considering differing temperatures, humidity, and the array of positions a watch on the wrist goes through in a day. That means RGM must not only test for six positions but also push for amplitude results greater than demanded by most manufacturers in the industry. The amplitude is the maximum angle in degrees through which the balance wheel swings right and left from its position of rest. RGM wants no amplitude position below 240 degrees. We watched in awe because the movement being worked on had more than 120 pieces. Some movements with multiple complications have over 200 parts, and many of the parts are so small that picking them up even with tweezers is nearly impossible. This job requires much skill and immense patience. A piece may have to be adjusted many times until it runs within the testing requirements RGM demands. Sample screws are used during the process, and the ﬁnal highly polished blued steel screws are used only when the technician is 100 percent satisﬁed the movement is running over time to a perfect speciﬁcation. Our watchmaker during this part of the tour—Helen Powell—explained that although she’s worked at RGM for more than 10 years, she’s been assembling 801’s for just over a year. 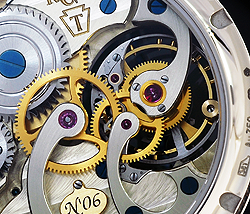 One movement can sometimes take three weeks to put together correctly to the high standard demanded by RGM. Next, we watched Roland at work on a Neuwiler Rose Engine. There are only a few craftsmen with the skill of guilloché, and Roland stands among these remaining experts. Guilloché is a form of engraving that decorates objects with geometric patterns. The French engineer Guillot is reputed to have invented it. It is also referred to as an engine-turning machine. People who can operate the machine are as rare as the machines themselves. Seeing Roland’s son (also named Roland) work on a second Rose machine as he painstakingly learns the trade was another highlight of the day to me. Engine turning is time consuming and unforgiving. The speed of rotation and amount of pressure are manually controlled. An absolutely steady hand and total concentration are essential to ensure regularity of the pattern and correct consistent depth of the engraving. One lapse of concentration may produce visible ﬂaws, causing the piece to be scrapped. Later in the day I saw the younger Roland’s result. Somewhere he made a miscalculation and the curves have not all lined up. In ﬁnancial terms a whole day’s work was wasted. In true terms it’s just part of a long learning curve. The next part of the tour was in the basement where RGM has its CNC milling machines and where it performs plate and bridge ﬁnishing. The CNC machine and the various ﬁnishing posts are in the basement because milling and ﬁnishing metal parts cause dust and vibration, which are detrimental to the manufacture of timepieces, especially wristwatches with their tiny subassemblies. The room and equipment were spotless, and it all looked as immaculate as the upstairs “clean” area. In any watch movement (excluding the Swatch watch), the plate is the biggest part. It is like the chassis that holds the bridges and all the other parts in a watch. The plate can vary in shape, depending on the watch, and is gold- plated, or rhodium-plated brass. The traditional material in high-end watchmaking is German silver, sometimes called nickel silver. It is just 20 percent nickel, while the rest is copper and zinc. The plate is manufactured by an elaborate process of milling, turning, drilling, and tapping—a painstaking process fraught with complications. RGM uses only German silver for all its bridges and plates. At RGM this room accommodates not only many machines but also two young and very capable men—Ryan Hufford and Adam Robertson. Ryan clearly explained the operations and is as passionate as any watch aﬁcionado. He explained that the CAM software creates a program for every plate, bridge, or milled part. Each contains thousands of lines of code to painstakingly mill out each part with the highest level of precision. Ryan also told us about the debugging process that takes place during the development of a new caliber or part. Ryan started the CNC machine, which was remarkably quiet—not like the old lathe days when metal and water ﬂew everywhere. The trick, he explained, was setting the optimal speed of the CNC machine: if too fast, the expensive drill tips wear out too soon, and if too slow, the time and cost to make each watch rises dramatically. The next stage is what I call plate decoration and ﬁnishing, correctly called “Anglage,” “Côtes de Genève,” and “Perlage.” I knew these three decorations took time and great patience but again I was amazed at the skill and time needed for the process of anglage. The sides of the bridges are simply brushed and the bevels on the top edges are polished—that is anglage in French. The patience and skill in hand polishing the beveled edges were most surprising. The German silver is soft and simple polishing removes too much metal and worse, starts a second ﬂat edge—something RGM would never allow on a ﬁnished timepiece. It takes immense concentration and skill to look through an X4 Loupe while polishing the beveled edge to RGM speciﬁcations. In 2012 the National Watch & Clock Museum had the special exhibition Time Out, which highlighted the role time plays in sports. Roland and I explored the exhibit and saw specialty watch dials. I never thought more about it, but for Roland a seed was planted. He was determined to make a wristwatch like the 1892 Waltham Baseball dial pocket watch—an exact replica down to the enamel dial as a wristwatch. Before the unveiling, Roland gave a personal tour of the National Watch & Clock Museum. It is impressive how much he knows about horology and the pieces in the Museum, and everyone appreciated his guided tour. I certainly did, and I am a guest curator here! The creation of an enamel dial is a high-risk art. Enameling is a technique in which colored powdered glass is applied to a metal plate. The surface is then heated to a temperature high enough to cause the powdered glass to melt and form a new surface. The Grand Feu technique ups the stakes. It involves meticulously coating a watch dial with successive layers of enamel. Once a layer is ready, the dial is heated at extremely high temperatures ranging from 1,472° to 1,652°F (800° to 900°C). The repeated baking of each individual layer ensures a uniquely crisp aesthetic and permanently sets the enamel. Using high heat to create these beautiful dials also poses a risk. Each time it is reﬁred, the danger of cracking, melting, or burning increases. The Roman numerals and baseball ﬁgures are also baked onto the surface. An enamel dial will not fade and will look the same in 100 years as it does today. With great risk comes great reward: the appearance of a real glass enamel dial is unmistakable. The next obstacle is ﬁnding an artisan who could create a high-quality Grand Feu (French for “Great Fire”) enamel dial. There are only a handful of master enamellers worldwide. “If I couldn’t do it right, I wasn’t going to do it,” recalls Roland. The dial had to be made exactly the way the original was made. A three-year search located an enamel artist willing to take on the project. Two quotations came to my mind during the tour and unveiling. First, John F. Kennedy: “Ask not what your country can do for you; ask what you can do for your country.” Second, Martin Luther King Jr.: “I have a dream.” These two quotes embody the man who runs a small but important piece of watch history in the heart of Lancaster County, PA, for several reasons. In 1969 the Hamilton Watch Co. ended American watch-manufacturing operations with the closure of its factory in Lancaster, PA, and shifted manufacturing operations to the Buren factory in Switzerland. By 1972, Hamilton, founded in Lancaster in 1892, was liquidated and basically ceased to exist as we knew it. In 1992 Roland made the difﬁcult decision to return high-end watchmaking to Lancaster. Born in 1961 in Baltimore, MD, Roland went to vocational school for carpentry and cabinetmaking at Harford Technical High School in Belair, MD, during his last two years of high school. He worked summers as a carpenter’s helper and spent his last year of high school in school for half the day and working at Danecker Clock Co. in Fallston, MD, the other half. He graduated in 1980 after which he made clock repairs from his parents’ home. From the summer of 1986 through December 1987 Roland attended WOSTEP (Watchmakers of Switzerland Training and Educational Program). He started RGM in 1992. At the RGM tour I could see that modern manufacturing coexists with antique, hand-operated machinery. Hand-blued screws and hand-polished components are at home among the close tolerances afforded by automated machines. RGM has ﬁve vintage machines for engine turning; three Rose Engines and two Straight Line Engines. The Plant Rose Engine gets the heaviest use. The 12-member staff does not just manufacture and assemble all the components that make a wristwatch. The individual parts are lovingly prepared, assembled, and tested. Each part is brought into existence with the same high level of care and attention. Attention to detail is obvious in the ﬁnishing and decoration, in the shape of the German silver bridges, and in the quality of ﬁnishing on the steel parts. These watches are made to last forever. In the words of perhaps today’s greatest Swiss watchmaker, Patek Philippe, “You never actually own a Patek Philippe; you merely look after it for the next generation.” So it is with an RGM timepiece. RGM’s goal is to offer not only the ﬁnest watches made in the United States but the ﬁnest watches available. Roland and his team ﬁrmly believe that this requires equal efforts to improve current methods while preserving tradition. Roland cannot make in-house, he attempts to procure locally. A local company makes parts for watch cases that he does not make in-house. Roland takes the same approach when it comes to launching an exciting new product. He chooses to do so at the nearby NAWCC Museum, asking all his invited visitors to make a small donation that he presented to the Museum’s preservation funds. Finally, in terms of his dream, Roland as a watchmaker says, “Anyone who works in high-end watches, especially who is building them, wants his own movement. That’s really the heart of the watch. That is where it starts.” Where it all comes together for him is 801 West Main Street, Mount Joy, PA, inside the RGM design and manufacturing ofﬁces. In fact, 801 is the caliber (and name) of Roland’s ﬁrst original movement; it relies still on some Swiss parts, including the jewels, balance, and hairspring, but the wheels, bridges, and mainplates are all manufactured here, and every timepiece is fully assembled and tested at 801 West Main Street. In 2007 Roland turned that dream into reality with the caliber 801, a 16-ligne in-house movement that took about seven years to develop. It is so versatile that it can be used for either a wristwatch or a pocket watch. In 2010 Roland launched the ﬁrst Tourbillon series ever made in the United States, the caliber MM2 Pennsylvania Tourbillon. That new caliber, in tradition with Roland’s love for Pennsylvania, is signiﬁed by the state’s symbol—a keystone—surrounding a capital T in its logo. What do you get when you cross a historical, American-made pocketwatch with a clock made for military aircraft? You’re reading about it right now. The 801 Aircraft, from RGM, the Lancaster County-based watch company owned by watchmaker Roland Murphy, is a past-meets-present creation that completes a unique clock-pocketwatch-wristwatch timekeeping trifecta. The dial and hands were inspired by a clock developed jointly by Elgin and Hamilton during the 1940s for use in military aircraft. Today, the clock is known by the unromantic alphanumeric designation AN 5741-1. The 801 Aircraft’s movement is styled after the one used in an E. Howard pocketwatch produced in 1915. Today, both clock and pocketwatch are collectors’ items. Will the lovechild delivered by Mr. Murphy have the same staying power? Let’s find out. The dial incorporates many small details. It’s divided into five distinct sectors. The outer edge is slightly raised. Taking one step toward the center, the scale for the minutes and seconds is slightly sunken. The outer hour chapter, displaying the oversize numerals 13 through 24, rests on a broad, smooth band. The center portion of the dial, about the size of a dime, is sunken, and it hosts the a.m. hours and a small “RGM Professional” logo. The twin hour scales take a few minutes to get accustomed to, unless you’re the type who only looks at the hands. At the bottom of the dial, the oversize subsidiary seconds chapter is sunken and snailed. It features a tri-color display, along with RGM’s trademark Pennsylvania keystone logo and “Lancaster, Penna. USA” inscription. The modified diamond pointer hands are custom-made to follow the design of the AN 5741-1 clock. Though we like the shape and appreciate the historical fidelity, the hands strike us as slightly petite compared with the bold dial elements. We would have kept the diamond shape, but made the hands just a tiny bit beefier. Despite the busy dial, the white hands provide good legibility. When the sun goes down, the time can be read for 10 hours with eyes well-adjusted to the dark, so the display will get you through the night. The case measures 42mm in diameter and 12mm thick, including the domed crystal. The complete package weighs in at 86 grams. The bezel is tall but quite thin, showing off the dial to great effect and making the watch appear larger than it actually is. A fine satin finish covers the case, including the space between the lugs. The finish is very well done and catches the light nicely. It also makes the metal appear slightly darker and richer than would a polished finish. The lugs are long and curved, ending below the caseback, improving the fit against the wrist. The crystals have non-reflective coating on the inside only. RGM does this because, according to Murphy, an AR coating on the outside of the crystal always ends up showing marks. The oversize crown is simple in design and has no logo or other markings. It’s easy to grasp, but on our test watch, the setting mechanism felt slightly stiff, and we noticed a small amount of backlash, or play. Our test watch was not equipped with stop seconds, but that feature is available on this watch. Our 801 Aircraft came equipped with a medium brown leather strap with a pleasing mock patina. The strap has seven closely spaced holes, helping to ensure a comfortable fit. The lugs are 22mm apart, and after trying on several pairs of shoes, we can say that this watch looks great on a range of strap types and colors. Black crocodile dresses it up, dark gray leather is casually elegant, NATOs dress it down, and khaki looks great for summer. The RGM buckle is simple and sturdy enough with a satin finish that matches the case, and the engraved RGM logo works well. On the watch’s flip side, a thin, screw-in bezel surrounds a broad sapphire crystal that provides and expansive view of the movement. We picked up our test watch at RGM headquarters in Mount Joy, Pa., in Pennsylvania Dutch country, and we had a chance to tour the facility with Murphy to gain some insight into how the watch is made. During our visit, three things stood out: the fact that RGM makes more than 90 percent of the parts in this watch, that a great deal of handcraft goes into each watch, and that RGM is very committed to the “American-made” ethos. The movement powering the watch, Caliber 801, begins life as letter-size sheets of nickel silver, also called German silver. The sheets are different thicknesses, because the mainplate is thicker than the bridges. RGM sends the sheets to a nearby company that uses water jets to cut the sheets into playing-card-size pieces. These become the work-pieces from which the mainplate and bridges will be cut. RGM drills precise holes in the work-pieces to locate them on jigs that RGM also makes itself. These holes often have to be hand-broached to ensure a perfect fit. Murphy pointed out that when people think of movement manufacturing, they often overlook the amount of time spent making jigs and tools, getting work-pieces ready to be cut, and otherwise preparing for the machining and finishing that people typically associate with movement making. The machines that turn the small metal work-pieces into mainplates and bridges were made in the U.S. Most are produced by Louis Levin & Son in California. Another family-owned company in Florida creates custom machines, and RGM itself customizes machines to meet special needs. RGM also makes the tools these machines use. Most of RGM’s machines are the bench-mounted variety, not the larger free-standing machines seen in Swiss or German factories. RGM’s small-scale operation has a more personal feel than those factories do. One of the RGM-modified machines cuts teeth in the wheel blanks RGM produces. A technician loads five or six wheel blanks at a time, and each tooth is cut individually using an index system to guide the process, assuring that each tooth is identical. RGM also does its own traditional heat treating and bluing. This in-house process is primarily for small batches of parts, such as those needed for prototyping or repairs. Larger batches, such as the screws for the 801 movement, are sent to a company just down the road that uses a vacuum chamber to produce extremely clean heat-blued parts. RGM’s commitment to handcraft and bench work is partly a byproduct of the building the company calls home. That building, a former bank headquarters, is historic and quite elegant, but also a bit cramped inside. Narrow doors and stairways keep large machines out, and large machines tend to be the most highly automated. The only sign of automation we say during our visit was a pair of breadbox-size CNC machines that pick up their own tools. Otherwise, hands-on human involvement is the order of the day. Once the mainplate and bridges are cut, the real handwork begins. On the main floor, we watched a technician tapping screw holes in the 801 mainplate. He did this one hole at a time, with a small, hand-operated tap. Later, the screw holes in the bridges will be countersunk and polished. Blue enamel paint is hand applied to the engraved lettering on the plate and bridges. We were surprised to learn that this step is completed before surface decoration, such as Geneva stripes, is applied. Caliber 801 has very nicely polished anglage. RGM makes its own tools to hold each bridge as this work is done. The tools reminded us of X-Acto knife handles. Each bridge has its own tool. Applying the surface decoration is the final step in the finishing process. Each bridge is finished individually, by hand, because tiny variations in thickness can affect the process. Murphy said, “People think we finish all the bridges together – that it’s just zip, zip, zip, and they’re don. That’s not how we do it. It’s one bridge at a time, and it’s a pretty long process.” An indexing system on the finishing machine assures that the Geneva stripes line up when the movement is assembled. Caliber 801’s bridges were inspired by those of the pocketwatch made in 1915 by E. Howard Co., also called Keystone Howard (the Keystone Watch Case Co. had bought the rights to the E. Howard name some 12 years earlier). When the watch was new, it was priced at $350 – an expensive watch for the day. Murphy spent years tracking down a pristine example, and today it resides in the room-size safe on the building’s main floor. The high level of handwork and the lack of automation allow RGM to offer a wide range of customization options – far more than most manufacturers provide. Murphy told us he does not keep an inventory of assembled 801 Aircrafts on hand for people to walk in and purchase, because there is no “stock” model. If you put down a deposit on an 801 Aircraft today, it will be delivered in two to four months, built just as you like. RGM’s staff of five watchmakers and two technicians currently produces 60 to 70 Caliber 801 movements per year. This is a significant percentage of RGM’s total annual production, which Murphy told us runs 200 to 250 pieces per year. Our test watch features bridges decorated with côtes de Genève circuilaire and rhodium plating. As noted, the bridges have well-executed anglage, which is not mean feat given the variety of shapes they present. The large screwed balance keeps time at 18,000 vph. The mainplate is decorated with perlage, and peering through the wheels and bridges, we can see an engraved and painted keystone logo, the movement number, and the “19 jewels” notation. Our test watch kept good time on the wrist, gaining 4 seconds over 24 hours. On the Witschi machine, the results were consistently in positive territory. The greatest deviation was 5.2 seconds (+7.1 dial up, +1.9 seconds dial down). The average deviation was +4.9 seconds – almost exactly what we saw on the wrist. The complete timing results appear in the Specs box. If you want something unique, RGM’s 801 Aircraft is hard to top, especially given the customization options. The distinctive look, the home-brew movement, the range of options, and the American origin are all unusual. In our view, these factors make it a very appealing package. RGM’s Pennsylvania Series 801 - “Baseball in Enamel” While touring the National Watch and Clock Museum in Columbia, Pennsylvania, USA three or four years ago, our founder Roland G. Murphy became intrigued by a display of watches with unique enamel dials. The collection included a rare 1892 American Waltham Watch Co. pocket watch that housed a baseball-themed enamel dial. Mr. Murphy was captivated by a watch that married American watchmaking history with America’s pastime. The idea was born to make a modern watch inspired by this classic American theme. The finely crafted pocket watch is extremely rare; only a handful have been seen. Even less is known about what prompted Waltham to produce a baseball-themed piece. The late-1800’s was a heyday for America’s pastime; was it the popularity of the game that caused Waltham to create this extraordinary timepiece? No one knows for sure. Conjecture is that these watches were made for Waltham’s own baseball league, perhaps given to managers or players in recognition of various achievements. The next obstacle was finding an artisan who could create a high-quality Grand Feu (French for “Great Fire”) enamel dial. There are only a handful of master enamellers worldwide. “If I couldn’t do it right, I wasn’t going to do it,” recalls our founder. The dial had to be made exactly the same way the original was made. An enamel dial will not fade; it will look the same in 100 years as it does today. A three-year search located an enamel artist willing to take on the project. Creating an enamel watch dial is a high-risk art. Enameling is a technique in which colored powdered glass is applied to a metal plate. The surface is then heated to a temperature high enough to cause the powdered glass to melt and form a new surface. The Grand Feu technique ups the stakes. It involves meticulously coating a watch dial with successive layers of enamel. Once a layer is ready, the dial is heated at extremely high temperatures, ranging from 1472-1652°F (800-900°C). The repeated baking of each individual layer ensures a uniquely crisp aesthetic while permanently setting the enamel. Using high heat to create these beautiful dials also poses a risk. Each time it is re-fired, the danger of cracking, melting, or burning increases. The Roman numerals and baseball figures are also baked into the surface. With great risk comes great reward: the appearance of a real glass enamel dial is unmistakable. The watch in the museum’s collection from which we drew our inspiration features a detailed color illustration of a baseball player positioned at each hour mark. Each individual representation depicts a player in a variety of poses, including batting, throwing, catching, sliding and fielding. A crossed baseball bat motif in the center displays a banner reading “Waltham.” The company name, “American Waltham Watch Co.” is also lettered directly above the sub-second dial. Wanting to pay homage to this work of art, our RGM dial is strikingly similar. Because each known example of the Waltham watch did not have the same hands, we chose our blued steel Keystone hands as a nice complement to the white enamel of the dial. The watch is housed in a polished stainless steel “Pennsylvania series” case. Like many of the components of the Caliber 801, the case is also made right here in Lancaster County, Pennsylvania, USA. The keystone winding crown completes the Pennsylvania theme. We are again bringing America’s great watchmaking past forward, this time immortalizing baseball America’s pastime in enamel. This truly unique piece will last for generations - like the watch that inspired it. 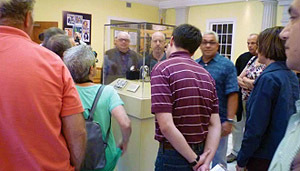 The watch was unveiled next to the original pocket watch on September 27, 2014, at the National Watch and Clock Associations’ museum in Columbia, Pennsylvania, USA. Many readers of this newsletter were present at the unveiling. For those who weren’t able to attend, please see our website and/or social media for photos from the day. The new model sports a technical style dial with large luminous numbers, which calls to mind the early days of intercontinental aviation. The dial displays hours 1 thru 12 and 13 thru 24, with emphasis on 3, 6, 9 and 12. A subtle calendar window at 4:30 completes the dial. The watch also features new luminous hands with a bold, yet classic, feel. A prominent element of the Pro Aviator is the American-made stainless steel case. This model also incorporates a curved sapphire crystal and vintage-style calf leather waterproof strap. Together, these features make for a watch that is functional, technical and aesthetically pleasing. Also based in Pennsylvania, Roland G. Murphy’s namesake RGM brand is the only one that has managed to make three calibers domestically with 90 percent of the parts developed in-house. 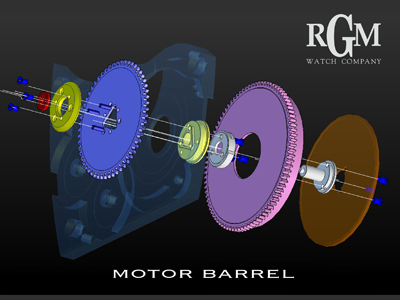 RGM’s American- made movements currently power about 25 percent of the brand’s annual production of 250 to 300 pieces. The Pennsylvania Tourbillon ($95,000) is its latest horological achievement. “There are other companies trying to say ‘Made in U.S.A.’ when they are really just assembling watches or movements,” says Murphy, who points out that the lines between manufacturing and assembling are often blurred. Glance at the watch on your wrist. It may be modest or magnificent but, almost certainly, it isn’t American-made. The modern watch business is dominated by European and Asian manufacturers at both the high and low ends. As a result, most of us have forgotten that for nearly a century, from the 1870s to the 1950s, storied American watch manufacturers like Hamilton and Bulova were known the world over for mass producing quality timepieces. But the diversion of American precision manufacturing for World War II and the quartz-watch technical revolution of the 1960s reduced watchmaking in the U.S. to a shadow of itself. By the mid-1970s, the market for mechanical watches had all but evaporated, and with it went America’s manufacturers. Today, while there are a few brands that claim to be “American made, there is really only one: RGM Watch Company in the small, quiet town of Mount Joy, Pa. RGM is keeping alive the watchmaking skills, processes and techniques that have nearly vanished from this country – and it is doing so successfully by being a low-volume niche business. RGM is named for its founder, Roland G. Murphy, a Marylander who spent his high school years learning cabinetmaking and working at Danecker Clock Company, which specialized in grandfather clocks. There, his curiosity in timepieces was piqued, and he began tinkering with clock movements, disassembling them and successfully putting them back together. Lancaster had been a hub of America’s watch industry since the 19th century, but in the 1970s, its premier firm, the Hamilton Watch Company, moved a portion of its operations to Switzerland. This country was the last bastion of mechanical watchmaking, and after Bowman, Murphy went there as a trainee in the Watchmakers of Switzerland Training and Educational Program (WOSTEP). Valuable though his WOSTEP training was, Murphy graduated just before the industry began to boom again. With few job offers, he returned to Lancaster, where he landed a product-development position with the Hamilton Watch Company. His enthusiasm and traditional watchmaking knowledge helped him to take on a varied role and, in the process, he learned product development, supplier relations and logistics. “I had a watchmaking-and-restoration background, and I was getting an education in how the modern industry worked,” he recalls. Murphy stayed with Hamilton until about 1991, doing his own restoration work on the side. By that time, he was losing interest in corporate watchmaking. “The product was getting cheaper,” he says. “When I started, we still made gold and gold-filled [watch] cases. By the time I left, we had maybe three microns of gold in a case. It was just about money.” Money has never been a prime motivator for Murphy, but the passion and desire to build lasting mechanical timepieces is. When he formed RGM Watches in 1992, his goal was merely to ply his craft on his own terms. Working from his attic, Murphy launched the company by doing watch restoration and repair, and by buying and selling watches while he designed the first RGM watches. Rendered in classic styles, they used Swiss components, and Murphy relied on proven suppliers and connections he had from a generation of watchmaking executives that was rapidly disappearing. Though RGM assemble high-grade watches based around Swiss movements, Murphy’s ambition was to become a manufacture, a French term denoting a firm that fabricates nearly all of its parts. Despite marketing-speak to the contrary, at the time, only a handful of firms actually fit that description, and all were in Europe. Murphy decided to make his own movements in 2000, embarking on a daunting intellectual, experimental, and artistic process. It took seven years. Along the way, he found the artisans he needed and a place to put them, establishing the RGM headquarters in a former bank building, complete with its original vault. There, six watchmakers, including Murphy, craft watches based on three different RGM movements: Calibers 801 and 20, and the nearly $100,000 Pennsylvania Tourbillon. 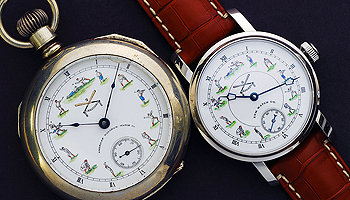 The Caliber 20 and the Pennsylvania Tourbillon require anywhere from six months to a year to make, and thus far, the company has made fewer than 200. They are true luxury items, hand-fabricated using RGM’s own jigs and tooling. The dials, hands and most movement pieces are made in-house using a combination of vintage machines and modern CNC machines. RGM is known particularly for its “guilloché” dials, intricately patterned using machines Murphy has personally collected. Where RGM cannot technically or economically make a component, it is sourced locally. Watch cases, for example, come from a precision machine firm a few miles away to be finished and assembled in the old bank. More than 90 percent of the content of RGM’s proprietary Caliber and Tourbillon watches is made in Pennsylvania. RGM’s classic movements echo those of America’s first and finest makers, using proven teeth shapes and shying away from exotic materials because Murphy insists they be reliable and, unlike other haute horlogerie watches, repairable decades from now. Possibly. But for anyone with a serious affinity for luxury timepieces and a desire for an expertly crafted American mechanical watch, it has surely helped. Invited to tour RGM Watch Company! Because of the success of our 20th anniversary event two years ago, we have decided to open our doors again for a behind-the-scenes tour of RGM on Saturday, September 27, 2014. Many of you know how passionate Roland Murphy is about preserving alive the ancient craft of guilloché. This tour will allow you to see this machinery in motion as he demonstrates how we recreate some of the beautiful engraved patterns characteristic of our watches. Witness firsthand how we marry old with new by observing vintage machines working in harmony with modern technology to create unique timepieces. The tour will also provide the opportunity to view the making and finishing of watch parts and assembly of movements. We will provide our guests time to examine our timepieces. Should you decide to take advantage of this occasion to acquire one of our watches for yourself, we will be offering special show prices for that day only. The second phase of the event will take place at the National Watch and Clock Museum in Columbia, PA. As a special bonus, attendees will be guided through the museum by Mr. Murphy himself. Space is limited. We are accepting guests on a first come, first served basis. A modest donation, which will be presented to the NAWCC Museum, will confirm a reservation. Reserve your spot now by contacting Stephanie Hickman at stephanie.hickman@rgmwatches.com. INTERACT WITH RGM ON SOCIAL MEDIA! Keep up to date with RGM by following us on social media. Find out what's new; learn about special offers, contests and upcoming events at RGM. Tachometer Scale The tachometer scale is calibrated to show the speed of a moving object, such as a vehicle, over a known distance. The standard length on which the calibration is based is always shown on the dial, e. g. 1,000, 200 or 100 meters, or, as in this case, one mile. As the moving vehicle, for instance, passes the starting-point of the measured course whose length corresponds with that used as the basis of calibration, the observer releases the chronograph hand and stops it as the vehicle passes the finishing-point. Telemeter Scale By means of the telemeter scale it is possible to measure the distance of a phenomenon which is both visible and audible. The chronograph hand is released at the instant the phenomenon is seen; it is stopped when the sound is heard, and its position on the scale shows at a glance the distance in kilometers or miles separating the phenomenon from the observer. ( Calibration is based on the speed at which sound travels through the air, viz, approximately 340 meters or 1,115 feet per second ). For example, during a thunderstorm the time that has elapsed between the flash of lightning and the sound of thunder is registered on the chronograph scale. Coming in March! We will have the new RGM Classic Chronograph Model #455. Less than 100 watches will be made with this classic 1940's inspired design. Pennsylvania Watchmaking: A Time-Honored Tradition Lancaster County, once known as the cradle of the American watchmaking industry, has a rich history in timekeeping. The Hamilton Watch Company in Lancaster produced its first watch here in 1893 and over the next century would make some of the finest timepieces in the world. With such a rich history in watchmaking, it is no surprise that Pennsylvania is also the location of two relatively new watchmakers who have decided to make a name for themselves in the timekeeping industry: RGM Watch Company in Mount Joy. Roland G. Murphy caught the watchmaking bug while working at Hamilton Watch Company back in the 1980's. "Hamilton Watch was owned by a Swiss company back at that time," Murphy says. "Eventually I decided I wanted to do my own thing and have been doing it ever since." His company, which is located in Mount Joy, Lancaster County, has been filling a niche in the high-quality watchmaking world since 1992. The RGM Watch Company produces between 200 and 400 watches a year. In 2008, he introduced the RGM 801, which Murphy says is the first high-grade mechanical watch movement made in America in decades. His small company, which employs 10 people, caters to enthusiasts and watch collectors but will work with anyone who is interested in purchasing a high-quality timepiece. In crafting watches, Murphy marries the old with the new by using antique, hand-operated machinery along with more modern, automated machines. Murphy owns five guilloche machines that he uses to embellish his watches. "I use the antique and hand-driven machines to cut decorative geometric engravings on the movement or the dial," he says, explaining that this method was also used on Faberge eggs for the czar of Russia. "The work is difficult, but the eye appeal is very beautiful." The response to RGM’s announcement of our third in-house movement, Caliber 20, has been strong and positive. We’re glad to say that the first completed watches are already coming out of Mount Joy. The first example to be shipped from RGM’s workshop (pictured) was a custom order, and features some very special components such as a platinum case, solid rose gold guilloche dial, and moon discs of mother-of-pearl. Created to celebrate the 20th anniversary of RGM Watch Company, this milestone movement incorporates many elements that recall the finest products from the heyday of American watchmaking: the barrel-shape of the movement, the delicately curved bridges, and the smooth operation of the motor barrel. It carries on the traditions of History in the Watchmaking-- a concept dear to RGM. The visual cues found in all three of our in-house movements recall benchmark creations from the likes of Hamilton and Edward Howard. Our use of multi-toothed clicks, jeweled barrels and the “secometer”-style seconds display should signal to the initiated that RGM is serious about honoring the American traditions, though such features are intended to captivate all aficionados of fine watchmaking. As much as we wish to celebrate the past, we are serious also about advancing the cause of American watchmaking. This can be seen with an examination of the Caliber 20’s moon phase construction. The most frequently seen type of moon phase display is based on a 29-tooth wheel which is inaccurate enough in a 29.5-day cycle that it will need to be adjusted several times yearly. The Caliber 20 moon phase is constructed such that, if kept running, the accumulation of a similar error would require 120 years. It is gratifying for us to have received such excellent support from our customers and fans—so much so that the waiting list for Cal. 20 watches is larger than we anticipated. We want to assure you that all appropriate care is being taken to fulfill the orders with the highest quality and least delay possible. The RGM Model 300 Diver, favored alike by hobbyist outdoorsmen and professional divers has recently received an upgrade to the graduated bezel insert. Experienced divers know that the rotating bezel of their timepiece is often subjected to shock or contact with undersea obstacles. It is an easily replaced part of course, but a very useful one for timing dive stages, so protecting it is imperative. Recognizing this, RGM has developed a highly scratch-resistant ceramic bezel insert to enhance both the durability and the beauty of the Model 300. Available on all new Model 300 watches, the bezel is offered in both black (Model 300) and blue (Model 300-2). The watch still features the same rugged 43.2mm stainless steel case with 5mm thick sapphire crystal but is now more able to withstand exposure to hazardous, unpredictable environments. A difference in color and texture is evident in a comparison of the Model 300-2s original insert with the new ceramic ones; the brushed metallic glow has been supplanted by a more muted and subtle splash of glossy color. In both ceramic versions, a tad more contrast is apparent, a visibility benefit that should be welcome to divers. The new bezel inserts can be retro-fitted to any existing RGM 300; owners interested in this upgrade are invited to inquire with RGM Service. All Model 300s are water resistant to 2500 feet, made of high-quality steel, and available with steel bracelet, or with silicon straps of blue or black. Custom options are also availableas with any RGM watch including mother-of-pearl dials or personalized engraving. Please contact us to discuss all the options and to learn more about RGM Watch Company. Our Third in-house movement "Caliber 20" is our first with a Motor Barrel. Top grade American railroad watches from the past had a "Motor Barrel" , models like the Illinois Bunn Special , Hamilton 950 , and others from great American Watch Brands. The "Motor Barrel" is an American invention and was used only on the highest grade models. The benefit of the design is that is reduces friction and wear in the mainspring barrel bearing surfaces, thus transmitting power more efficiently. It was a natural choice to incorporate the "Motor Barrel" in our new in-house movement. Case: American Made, Polished Stainless Steel, Sapphire Crystal, Sapphire Crystal display back, 42.5 mm X 38.5 mm / thickness 9.7 mm. Functions: Hour , Minute , Seconds on Disk , Precise Moon Phase. Caliber: RGM 20 , American Made, manual Wind, 19 Jewels, 18,000 vph, Cote de Geneve, perlage , Anglage finish, Unique Motor Barrel System. Dial: Option of a Skeleton or *Full Guilloche. ( *full guilloche images are not shown ). Hands: Blued Steel Keystone Hour and Minute hands. Strap: Brown or Black Louisiana Alligator. Buckle: Signed RGM Stainless Steel. Pricing: $19,500.00 *Please contact us for pricing in Gold. You're Invited: Tour of the RGM Watch Co.
You are cordially invited...Tour of the RGM Watch CO & the NAWCC Museum. Since it’s founding in 1992, RGM has become a well-known brand among watch aficionados and collectors. As we are a small company who’s focus is on creating a limited number of bespoke, unique timepieces each year, RGM is not often able to grant the many requests we receive to tour our facility here in Lancaster, PA. In celebration of RGM’s 20th anniversary, we are providing a special opportunity for you to see American Watchmaking here at RGM. On Saturday, September 1, 2012, we are opening our doors to invite you to a rare, behind-the-scenes tour of RGM. Many of you know how passionate Roland Murphy is about preserving alive the ancient craft of guillochè. This tour will allow you to observe this machinery in motion as he demonstrates how we create some of the beautiful engraved patterns found on our watches. You will also witness firsthand how we marry the old with the new by seeing vintage machines work in harmony with modern technology, such as our CNC milling machines, to create our unique timepieces. This tour will provide the opportunity to observe our watchmakers assemble movements, refinish watch parts and cases, and the making of watch parts. We will provide our guests time to examine our timepieces personally. Should you decide to take advantage of this occasion to acquire one of our watches for yourself, we will be offering a Special Show price for that day only. The second phase of this event will take place at the National Watch and Clock Museum in Columbia, PA. As a special bonus, attendees will be guided through the museum by Mr. Murphy himself. Because space is limited, we request you reserve your attendance as soon as possible by contacting Richard Baugh at rgmdesigns@aol.com. A modest donation, which we will present to the NAWCC Museum, will confirm your reservation. Attendees will be provided a two hour break for lunch, then reconvene at the NAWCC Museum. National Watch & Clock Museum, Columbia, PA 17512, 2:30 p.m. to 4:30 p.m.
RGM Celebrates its 20th Anniversary, 1992-2012 To commemorate our 20th anniversary, we are excited to announce Caliber "20", our third in-house American-made movement at the GTE in Geneva Switzerland. "Caliber 20" is our first with a Motor Barrel. Top grade American railroad watches from the past had a "Motor Barrel", models like the Illinois Bunn Special, Hamilton 950, and others from great American watch brands. The "Motor Barrel" is a American invention and was used only on the highest grade models. The benefit of the design is that it reduces friction and wear in the mainspring barrel bearing surfaces, thus transmitting power more efficiently. It was a natural choice to incorporate the "Motor Barrel" in our new in house movement. Caliber 20: Functions: Hour / Minute , Second, Moonphase. Caliber: American Made, Manual wind, 22 jewels, 18,000 vph. Main plate and Bridges Made of German Silver, Jeweled Motor Barrel, Train Wheels with Shaped Arms, Circular Cote de Geneve, perlage & Anglage. Also featured at the GTE event this year - RGM's new Model 801 Professional "Aircraft" ,and our New Ladies only RGM. History in Watchmaking RGM Watch Company was founded in 1992 by American watchmaker Roland G. Murphy; ever since, he as been "making history in watchmaking" here in America. This simple phrase describes much of what takes place at RGM. While continually producing bespoke timepieces, such as the Caliber 801 and the Pennsylvania Tourbillon, RGM has kept the great traditions of fine watchmaking in focus. Modern manufacturing co-exists with antique, hand-operated machinery. Hand-blued screws and hand-polished components are at home among the close tolerances afforded by automated machines. Our goal is to offer not only the finest watches made in the USA, but the finest watches available, and we believe this requires equal efforts to improve current methods while at the same time preserving tradition. The RGM web site enables visitors to become familiar with our company, our products, and our repair and restoration services. Read the interviews, admire the custom-built watches, watch the films, and you will begin to understand why RGM has so many admirers and repeat customers. People who buy an RGM watch often return for another, utilize our repair and restoration services, and tell their friends. RGM Watch Company is located in a small town in Lancaster, Pennsylvania, an area with a rich history of watchmaking in America’s past. The time-honored approach of dealing one-on-one with people is instilled in RGM, and is as much a reflection of where we live as where we work. We take great pride in doing a job the right way while providing great value. RGM is proud of manufacturing watch parts, cases and movements here in the USA. In the 1880's the great age of modernized watchmaking began in America. Today, both history and watchmaking are alive and well at RGM.